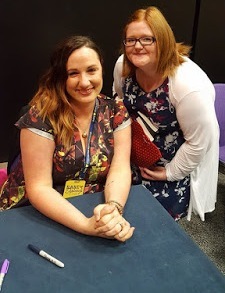 Today author Rachel Higginson talks her latest bookish news, favourite dessert AND what her motto for 2016 is! READ ON to find out more! Can you tell readers bit about yourself? By day I'm a wife to my high school sweetheart and husband of ten years and mom to four gorgeous kiddos that keep me so super busy. And by sleepless night I'm a romance writer that gets to have her dream job and write books for a living! I write a little bit of everything from young adult paranormal romance to zombie horror romance to adult contemporary romance. I love trying out new genres and exploring new worlds! I've published 25 books and co-authored 2 more! What's your latest bookish news? In the fall I released my latest adult contemporary romance, Every Wrong Reason! It's a second chance love story that will break your heart, but then piece you back together again. And right now I'm publishing installments of my zombie dystopian novella series, called Love and Decay: Revolution. The series releases in 20,000 word novellas every two weeks until May. It's a really fun series about zombies, the end of the world and finding someone to share it with! In 140 characters tell us why we should read your books? I love epic romances, sassy heroines and strong, flawed heroes. I write complicated people in complicated worlds. And I believe in happily ever afters. So a typical day for me is pretty much chaos! :) I have these four crazy kiddos that have to be everywhere at all times. I swear I live the majority of my life in the car. I try to squeeze in writing during the day, but usually I'm playing taxi or keeping up with laundry and the house and managing social media and the business side of writing. After my older kids get home from school, we knock out homework and practices, then sit down to family dinner, head straight into bedtime and finally at around 8:30 pm, I'm back to work where I finally get some actual writing done! On most days I work until about midnight when I crawl up the stairs to bed, sleep for a few hours and get right back to it the next day!! I have to admit that I don't work every night though. Sometimes I play hookie and my husband and I play board games- we're very competitive... ahem, lovingly competitive- or find a Netflix show to binge! Out of all your characters you've wrote about, who is your favourite and why? Gah! That's like picking a favorite child! Okay, maybe it's slightly less hard. I'm going to have to go with Eden Matthews from my Star-Crossed series. She's the most like me in personality and she has great big hair like me too! :) But also Reckless Magic was the first book I ever published and what set my career in motion, so I'll always have a special spot for her in my heart! Are you currently reading anything at the moment? Do you like it? I'm currently in the middle of three nonfiction books and two fiction books. I am usually always reading multiple things at a time. But I have to say that out of all of them, I just started Shatter Me by Tahereh Mafi and I'm loving every second of it! Do you have any inspiration for aspiring authors? I'd just say to write what you love, what makes your heart pound and steals all of your daydream thoughts. Imagine walking into a bookstore and picking out a book you can't wait to read. Write that book. Song: Oh, gosh. This one is so hard! I love music way too much. Right now I'm obsessed with Castle by Halsey. Cannot get enough! Dessert: Tiramisu. All day every day. Motto/Quote: For 2016, I've adopted this saying as my motto for the year: Do the things that set your soul on fire! What do you think of the Q&A? Have you read any books by the author?